One of the things I love about being an artist and a teacher, is the opportunity to meet new people. Being an artist itself is a continual learning adventure but the additional role of teaching can bring a whole host of extra rewards. Working with others no matter what their level of knowledge can show you new skills and new ways of doing things. Crucially you can also learn new things about your self. Being an artist can be a fairly isolating time and at times it is good to have the peace and contemplative space of the studio. However, I also find it important to occasionally get out of the studio environment and make the most of opportunities to work with other artists and see new places. The great thing about this trip to Australia, and working for Fibre Arts, was that it combined all those things. Group photo o nthe last day - with my students from the Print and Stitch class, at Woodlawn. We were feeling a tad relieved to get the exhibition of work up. For the second week we were located at St. Johns College, Woodlawn, New South Wales and from the outset it was clear that the exotic, milder climate in this region of Australia would provide a very different kind of vista to the first week in Victoria, where the temperatures had been much lower. The school was sited fairly high up on a hillside and surrounded by a river that virtually circled around the entire area. Early morning especially provided some beautiful misty views - it didn't take long for me to regret not packing my camera - I had to resort to getting pictures with my phone. Student work 'detail' from my print and stitch class. 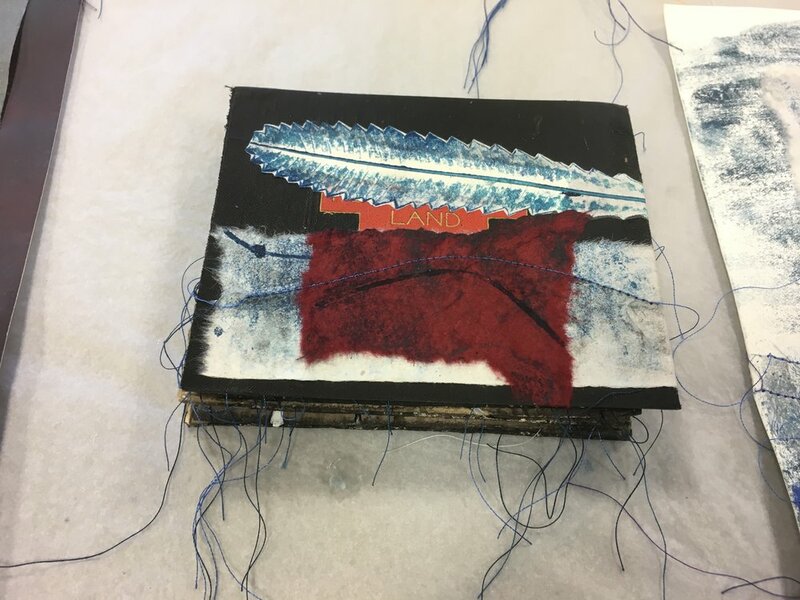 Student work In the final exhibition - book piece using a found book, mono print, collage and stitch. Detail of student work using found book covers, monoprint, collage and stitch. In the second week we all got a bit obsessed with book making - Art Books of course. This was helped massively by the fact that the trade stalls had lots of old books fo sale. In an immersive experience such as Fibre Arts Australia ideas can become contagious and we were all learning from each other - whether it was a method of making or a way of using the materials. In our Print and Stitch Class we also had time for a nice long and meaningful session on the Saturday morning for a group critique - this was the first time a few of them had ever done anything like that and they found it to be a very useful way to reevaluate their work and move forward.